Singapore was ranked 10th globally in the 2015 Compass Report, the only Asian city that made it. But while Singapore is proud of its startup achievements, foreign entrepreneurs are obtaining the largest returns from its ecosystem. 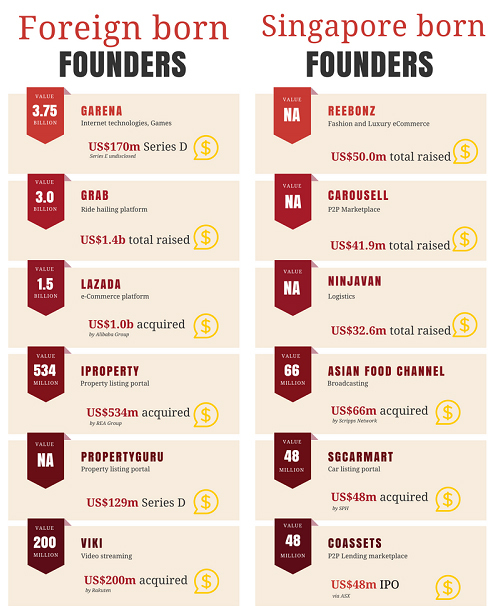 Headlines for larger fundraising and exits have been dominated by startups with foreign-born founders like Viki, Lazada, Propertyguru, Garena, Grab, and iProperty. Of course, there are successes from Singaporean founders as well. Carousell, Reebonz, Ninjavan, AFC, SgCarMart, and CoAssets are the more prominent ones, but they have less than US$100 million in current valuations and exits. If all conditions were the same, shouldn’t Singapore-born entrepreneurs have similar successes like their foreign counterparts, even more so when two-thirds of companies formed are locally owned? In fact, what you are noticing now is a growing gap of success between the two groups. What are the factors causing this disparity? As a small nation with limited size and resources, Singapore will always be an open economy, as it depends greatly on trade with others. Government officials tell me that meritocracy is a pillar to ensure successful individuals and companies are rewarded for their successes, regardless of background. Protectionist policies to defend local entrepreneurs from foreign-born ones are viewed as unsuitable and contradictory in an open economy. So when economic policies are created, it is open to anyone who can boost Singapore’s status and GDP. Once a foreigner arrives in Singapore, it is a new beginning. He leaves everything behind and tries to achieve his dream in a new land. (This is much the same as the migrants of Silicon Valley who seek the American dream.) This migrant is focused on growing his startup and thinks he must prove his worth, as he is new to the country. He can work seven days a week without any major distractions; he has the spirit to succeed. But for the local born, he struggles to become an entrepreneur. But for the local born, he struggles to become an entrepreneur. Upon graduation, he is saddled with student loans, and his parents will pressure him to focus on working first to repay the debt. Along with this, there is a cultural resistance preventing him from creating a startup. Instead of pursuing entrepreneurship, Singaporeans enter a nine to five work week while the passion for starting something wanes. Further temptations like an existing base of family and friends make a Singaporean less committed, should he become an entrepreneur. And with Singapore’s hunger for work-life balance, entrepreneurs unwittingly follow suit. This is evident in Block71 which becomes a ghost town at night and where offices are dark during the weekends. Failure is still not celebrated in Singapore. Rather, it remains a shame that entrepreneurs cannot bear. This is why, after their first failure, many give up and return to the workforce. I wrote on this topic in detail in another article. To be an entrepreneur is to keep failing, learning from mistakes, and finally finding success. But for Singaporeans, with family and financial obligations, there is a short runway and limited attempts to take off again. If you study the history of the budget carrier industry in Southeast Asia, Malaysia-based AirAsia trumps the region in budget flights against struggling Singapore-based Tigerair. A startup naturally uses its domestic base as the beachhead to test its product fit. Singapore startups, however, face higher marketing expenses with lower yields in a small competitive domestic market. In comparison, Malaysian startups spend less in marketing to acquire traction from their population of 30 million, making the yield per invested amount higher. In a previous article, I wrote about why Singaporeans lack the exposure to problems and understanding them on a larger scale. Their tendency is to equate Singapore’s problems to the world’s, which clouds their ability to think beyond the country. A startup that solves a smaller pain point will be less likely considered by a VC. Institutional investors (VCs, PEs, and SWFs) are critical partners in a startup’s investment — from Series A onwards — and is a contributor to large valuations and exits. Their primary duty is to find the best ROIs. Singapore-born founders face global competition from day one in the battle for institutional funding. Obligations, cultural mental blocks, and a higher base cost make it tough for them to prove they are worth the investment. If we’ve identified the problems, what then can Singaporean entrepreneurs do to be at par with foreign ones and narrow the disparity of funding and exits? Cutting out foreign entrepreneurs is not the key, as some might suggest. The infusion of foreign entrepreneurs proves how successful the ecosystem can be, indicating that aspiring Singaporean entrepreneurs can also achieve the same. The idea here is to rethink the strategy of how local entrepreneurs can excel and produce startups of global standards. So what can be done? Singaporean entrepreneurs cannot compete in Uber-like verticals, where large funding is required to battle off competitors. Neither can they copy similar low-market entry ideas from other countries, as the domestic market is just too small. The Singapore government does recognize the nation’s resource constraints and are taking a long-term approach to identify areas where Singapore can be an industry leader. This strategy is quantified in a US$12 billion funding into the RIE2020 program. Rather than looking at me-toos, they should start building on what Singapore is focused on. Singapore will always be a premium ecosystem where talent is expensive but are of high quality. Local entrepreneurs need to rethink their approach; their product, business model, and technology must justify their premium location. Rather than looking at me-toos, they should start building on what Singapore is focused on. I reviewed over a thousand pitches in the last five years, seeing many Singaporeans and non-Singaporeans from different walks of life and varying industries. Singapore has a developed talent pool of, what Phillip Yeo coined, “whales” and rising “guppies.” But the Singaporean entrepreneurs I’ve met were not aware of the many talented scientists and engineers they could utilize. This is a mismatch between entrepreneurs and an untapped talent pool. IPs have been created but have little commercialization. A program called T-Up by A*STAR has been around, but I have yet to see many startups linking up with the agency’s engineers. Perhaps there is a need to create a healthier connection between the two parties. Successful Singapore entrepreneurs must recognize the duty of giving back to the community. I liken this to Olympic champion Joseph Schooling, who did not just win the medal but recognized his role as an inspiration to younger athletes. Similarly, in my defunct pro-bono iJAM incubator, we championed the pay-it-forward movement and made an impact on 38 startups. 600 startups also received one-to-one free advisories in those five years. My team of mentors was limited in expertise and connections but brought about change. Imagine the possibilities of an active group of former, successful entrepreneurs and corporate CEOs, all advising, mentoring, and supporting startups. The infectious energy and mentoring will change the mindsets of the next generation. Private bankers estimated Singaporeans private asset wealth at US$80 billion. I have seen many private family offices appearing in recent years due to estate planning and the passing of wealth from one generation to another. The patriarch is eager to get their children exposed to investing in startups but is skeptical and unfamiliar of investing in such. If we draw family offices into startup investing, it will make the angel investor network more sophisticated and mature. Private family offices not only bring potential funding into the angel and seed stage but also years of experience and connections. I was astounded when I observed entrepreneurship being taught in institutes of higher learning. Academics with minimal entrepreneurship experience were explaining business concepts; the internship required for these classes was to run a retail store! Not that I have anything against retail trade, but there is a limit to how much students will learn compared to Smart Nation technologies. I judged business plan competitions where ideas were mainly marketplace solutions rather than deep technologies. These competitions failed because students didn’t understand the problems deep enough before attempting to join. Entrepreneurship has to be re-taught to show the reality of life. I raised the NOC program by NUS, where I found graduates from the program provide a better perspective and understanding of how entrepreneurship should be. In fact, it has been producing a number of entrepreneurs who have made respectable exits. How Israel built a great startup ecosystem has been studied over the years. One major factor was its military training. Singapore has its own form of National Service but, unfortunately, it has not fully tapped into its potential for nurturing relevant skills (including entrepreneurship). I shared previously on how military leadership training helped shaped Singapore entrepreneurs in their thinking, but much more can be done. What interested me about Philip Yeo’s biography was how he coordinated 250 army misfits to become system engineers to achieve an important goal for the military. That in itself was an entrepreneurship example. Perhaps including entrepreneurs to review the training process might add a new dimension to groom out-of-the-box thinking. I have highlighted the institutions and policies that Singapore has created to support entrepreneurship: its talent pool of researchers and engineers in A*STAR, the government emphasis on deep technologies, the institutions of higher learning, and national service. Further, combine these assets with a pay-it-forward community and drawing private wealth to become angels. When a concerted effort is made to place entrepreneurship in focus, a change in mindset will start to happen; more and more local-born, quality entrepreneurs and startups will begin to appear. The question is whether Singapore prioritizes the grooming of entrepreneurs. After all, they will become the nation’s future economic leaders, which is a vital asset to continue the nation’s forward thinking. The quality of such leaders will very much depend on what is done now. This is the sixth article of the Heartware Singapore series, where the author shares on different topics to spur the Singapore startup ecosystem.